Adesope, O.O. ; Nesbit, J.C. (2013) Animated and static concept maps enhance learning from spoken narration. Learning and Instruction. Vol 27. Pp: 1-10. Clark, R. C.; Mayer, R. E. (2008) e-Learning and the Science of instruction. San Francisco: Pfeiffer. Galvis, A.; Hernández, A.; Mendoza, P.; Marenco. E. (1999) Ambientes virtuales de Aprendizaje: enseñanzas del proyecto OLL&T. Informática Educativa Uniandes-LIDIE. Vol 12, No: 2, pp: 271-294. Ginns, P. (2005) Meta-Analisys of the Modality Effect. Learning and Instruction. 15. Pp. 313-331. Kombartzky, U.; Ploetzner, R.; Schlag, S.; Metz, B. (2010) Developing and evaluating a strategy for learning from animations. Learning and Instruction. Vol 20. Pp: 424-433. Kühl, T.; Scheiter, K.; Gerjets, P.; Edelmann, J. (2011) The influence of text modality on learning with static and dynamic visualizations. Computers in Human Behavior. Pp: 29-35. Lee, C.H. ; Kalyuga, S. (2011) Effectiveness of on-screen pinyin in learning Chinese: An expertise reversal for multimedia redundancy effect. Computers in Human Behavior. Vol 27. Pp: 11-15. Lee, D.Y. ; Shin, D.H. (2011) Effects of spatial ability and richness of motion cue on learning in mechanically complex domain. Computers in Human Behavior. Vol 27. Pp: 1665-1674. Lee, D.Y. ; Shin, D.H. (2011) An empirical evaluation of multi-media based learning of a procedural task. Computers in Human Behavior. Vol 28. Pp: 1072-1081. Mayer, R. Y Moreno, R. (1998) A Split-Attention Effect in Multimedia Learning: Evidence for Dual Processing Systems in Working Memory. Journal of Educational Psychology, Vol 90, No 2, pp: 312-320. Salinas, M. (2011). 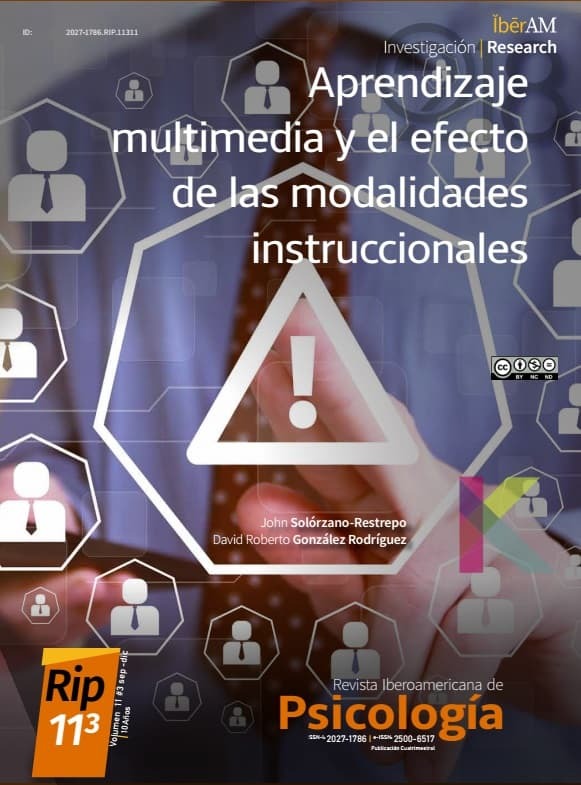 Entornos virtuales de aprendizaje en la escuela: tipos, modelo didáctico y rol del docente. SEMANA DE LA EDUCACION 2011: Pensando la escuela. Tema central: “La escuela necesaria en tiempos de cambio” (págs. 1-12). Buenos Aires: Pontificia Universidad Católica de Argentina. Sánchez, J.; Ato, M. (1989) Meta-análisis: Una altenrativa metodológica a las revisiones tradicionales de la investigación. En Arnau, J.; Carpintero, H. (Ed.) Tratado de psicología General I: Historia, Teoría y Método. (Pp: 617-669). Madrid: Alhambra. Sánchez-Pinilla M. (2003) Las tecnologías de la información y la comunicación: sus opciones, sus limitaciones y sus efectos en la enseñanza. Nómadas. vol 8. Scmidt-Weigand, F.; Kohnert, A.; Glowalla, U. (2010) A closer look at split visual attention in system- and self-paced instruction in multimedia learning. Learning and Instruction. Vol 20. Pp: 100-110. Scmidt-Weigand, F.; Schmitd, K. (2011) The role of spatial descriptions in learning from multimedia. Computers in Human Behavior. Vol 27. Pp: 22-28. Schüler, A.; Scheiter, K.; Rummer, R.; Gerjets, P. (2012a) Explaining the modality effect in multimedia learning: Is it due to a lack of temporal contiguity with written text and pictures? Learning and Instruction. Vol 22. Pp: 92-102. Schüler, A.; Scheiter, K.; Rummer, R.; Gerjets, P. (2012b) Is spoken text always better? Investigating the modality and redundancy effect with longer text presentation. Computers in Human Behavior. Vol. 29. Pp: 1590-1601. Schüler, A.; Scheiter, K.; Rummer, R.; Gerjets, P.; Huk, T.; Hesse, F.W. (2014) Extending multimedia research: How do prerequisite knowledge and reading comprehension affect learning from text and pictures. Computers in Human Behavior. Vol 31. Pp: 73-84. Tobías, A.; Catalá-López, F.; Roqué, M. (2014) Desarrollo De Una Hoja Excel Para MetaanáLisis De Comparaciones Indirectas Y Mixtas. Revista Española de salud Pública. Vol 88, No 15, Pp: 5-15. Yuviler-Gavish, Nirit. ; Yechiam, E.; Kellai, A. (2011) Learning in multimodal training: Visual guidance can be both appealing and disadvantageous in spatial tasks. International Journal of Human-Computer Studies. Pp: 113-122.